I don’t have my User name and Password for my Newspaper. E-mails have been sent to the publisher contact we have on file for your newspaper, as provided by the OCNA office. If you can't find the information, feel free to call ProTraining for your username and password. Our offices are open from 8:30 – 5:00 pm MST, and we can be reached toll-free at (866) 793-4820 or by email at info@protraining.com. How do my employees access the training? If you choose not to take advantage of the Newspaper Managed Model where the publisher purchases credits, then your employees can register using the Employee Managed Model. Simply ask them to create an account online which gives them the ability to automatically request training electronically to be approved by the designated manager within your newspaper. As the employee creates an account, they will be prompted for the name of your newspaper. From there, when they browse the training available, they can purchase their course by using a major credit card or Pay Pal or they can request that you pruchase the course for them. What if I want to grant the training directly to an employee? 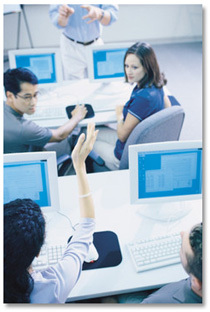 How can I view my employees training and testing? When you log-in to your newspaper area, you can select Users and Reports, and see many different areas of employee training and testing history. This area lets you track your employee’s progress and becomes a valuable took to help with their performance. Click away in here, you can’t hurt anything. No. Your purchase is limited to single user access. For security reasons, your training purchase may include viewing limits or IP tracking to protect us from password sharing. If you reach these limits, additional access will be added providing your account does not show an abusive pattern. No, all of our content and training material is available immediately online after purchase. Does your site keep track of my history? Yes. Our site keeps track of the training you take, the modules you have viewed, and the scores for each exam. It also gives you performance benchmarks and lets you know how you are doing in all areas. Can I review the exams I have taken? Can I pause my training, and come back to it later? Yes. Any training can be paused at any time for later use. When you are ready to continue your training, simply log back in and select Continue Training, and continue on. If you cannot remember your log-in information, click HERE and we will send that information to you to the e-mail address you registered with.